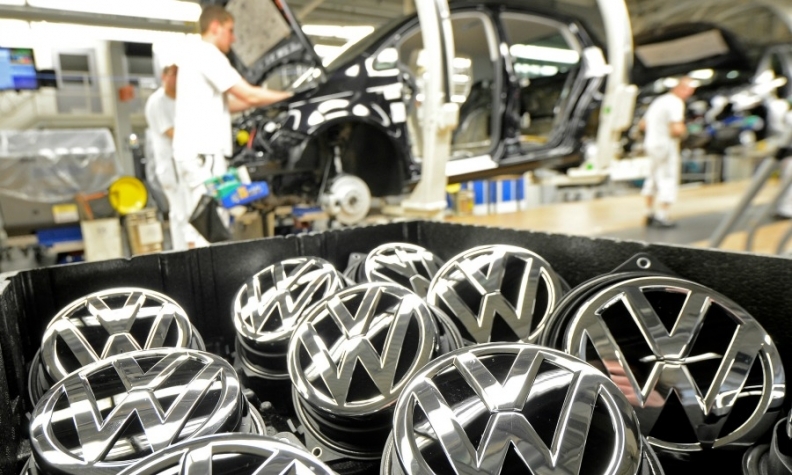 HAMBURG -- Volkswagen Group agreed to raise the wages of more than 120,000 workers in Germany by 4.3 percent starting in May, labor union IG Metall said on after a fourth round of talks yielded a deal overnight. The deal mirrors an agreement IG Metall won for around 3.9 million industrial employees in Germany this month after threatening widespread strikes. The union had threatened earlier this month to cripple vehicle production at VW, incensed by an offer from management to raise pay for staff at western German plants by no more than 2.2 percent over 12 months, about a third of the 6 percent it was seeking. As part of the agreement the automaker unveiled on Wednesday, workers at facilities in western Germany will also receive an additional payment equivalent to 27.5 percent of their monthly wage once a year from next year. Alternately, they can choose to take six additional days off instead of the payment, IG Metall said. The union had also pushed for improvements in VW's corporate pension scheme and more hiring of apprentices to help cope with an industry shift to electric vehicles and self-driving technology. But VW, facing billions of euros in costs and fines over its diesel emissions-test cheating scandal and huge investments for its subsequent transformation plan, had dismissed the demands. It had offered instead to raise wages by 3.5 percent and a subsequent 2 percent as part of a wage contract proposal covering 30 months.